The U.S. Army Security Assistance Command (USASAC) completed a foreign military sales (FMS) case to deliver eight UH-60M Black Hawk helicopters to partner country Tunisia this summer. USASAC, the U.S. Army Aviation and Missile Command (AMCOM), Security Assistance Management Directorate (SAMD); and the Program Executive Office - Aviation, Utility Helicopter Project Office (UHPO) worked with the Office of Security Cooperation - Tunisia, and the Tunisia Air Force (TAF) during the sale and delivery of the aircraft. 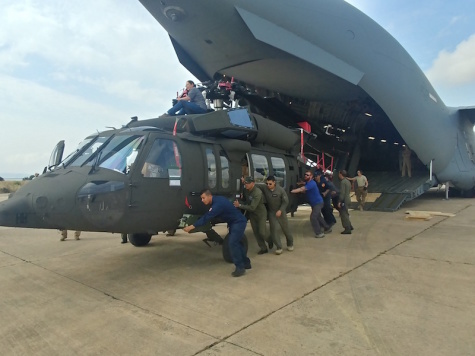 "Our teams worked cohesively to ensure we provided these aircraft in a total package approach," said Melissa Black, the senior FMS case manager, Tunisia UH-60M, AMCOM SAMD. "This is in accordance with the Security Assistance Enterprise mission. "The partnership and cooperation between USASAC, AMCOM SAMD, UHPO, Office of Security Cooperation-Tunis, and Tunisia Air Force is very good," Black said. "The TAF has extremely hard working and knowledgeable personnel that were able to articulate the requirements related to the varied mission profiles. "There is a misperception that the FMS is not quick, but we were able to expedite in certain areas that resulted in obtaining the aircraft and being able to deliver them in a compressed timeline," Black said. "A good team work ethic, knowledgeable team members, along with higher headquarters support will always lead to a successful program," said Glenn Lang, the country program manager with USASAC. "Delivery of the helicopters culminates another successful partnership resulting from USASAC's ongoing mission to increase military capabilities of countries that share similar security goals with the U.S."
Tunisia, along with other African countries, is facing security threats in the form of violent extremist organizations and criminal activities such as pirating in coastal waters. The eight Black Hawks will bolster Tunisia's ability to provide a safe and stable country for its citizens. "For example, operator level tasks such as unloading the aircraft from the transport plane, assembling and flight testing are accomplished by joint U.S. and Tunisian teams," Lang said. "Additionally, using the same aircraft and maintenance procedures increases interoperability on future, combined missions." Allies and partners are top priority for both the Department of Defense and Army. This sale will improve Tunisia's capability to deter regional threats and strengthen its homeland defense, as well as support counterterrorism and border security operations.